An unbalanced legacy system and politically driven policing witch hunt present the greatest challenges to the social cohesion and development of the PUL community today. It is time to rebalance the legacy of the past, and the political policing of the present. A statement by nationalist legacy activist and solicitor Paddy Murray, which has been carried in today’s media, stands as a shining example of the double standards of nationalism when it comes to the criminal justice system. Paddy Murray was an ardent supporter of the Loughinisland film No Stone Unturned, which was effectively trial by media, and even posted his support on his own social media account. The film- based largely on stolen documents- named loyalists and members of the security forces in connection with offences for which they have never been charged, let alone convicted. Nationalism, the media and civic society held the film up as a beacon of truth and justice. The fact that legacy activists were effectively running their own de-facto trial by media was conveniently brushed under the carpet. One prominent media contributor even went so far as to say that given the legacy structures weren’t working, it was the job of the media to fill that void. That is a rather astonishing narrative. 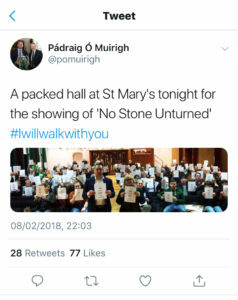 The fact that the No Stone Unturned film was carried out from an entirely biased viewpoint- it was produced by a company linked to the families’ solicitor and SF activist Niall Murphy- was also conveniently forgotten. No mainstream media outlets pointed out the clear conflict of interest, nor asked the difficult questions about where we as a society were going when journalism and legacy activism was subsuming the role of the criminal justice system. No one thought to make the connection between stolen HET and PONI documents being handed to a Belfast law firm, who also happen to represent the Loughinisland families, and all of a sudden- as if by magic- these documents are then posted anonymously to one of the journalists working on the film. I would love to see the receipt for that postage stamp! Where does the burden of proof lie in a ‘film trial’, or how is a suspect’s right to privacy and the presumption of innocence protected? To whom does someone found guilty via a documentary appeal? All valid questions, yet all ignored because it was politically convenient- until last night. Last night something politically inconvenient happened. Two IRA men were named- despite having never been convicted- as the Birmingham pub bombers. 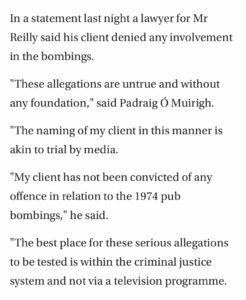 Astonishingly Paddy Murray, representing one of those named issued a statement. You would think Mr Murray would be continuing his support for trying legacy cases via documentaries or the media- you would think wrong. All of a sudden, once the tables turned on nationalist legacy activists and their surrogates, now they are parroting the arguments made on this website for over a year. When the media were naming alleged UVF or UDA members and former members of the security forces, things were great. This website then started naming IRA men- in a quite blatant attempt to return the serve- and nationalist legacy activists started threatening legal action. ITV have now named two IRA suspects, and all of a sudden nationalist legacy activists have turned around so fast I am surprised they aren’t dizzy; now they don’t think naming people in the absence of charge or conviction is appropriate. This highlights the key tenet at the heart of the legacy process; namely republicans and their surrogates want it all their own way. They think the courts exist to serve their purposes demanding expansive inquiries , they think the media exist to promote their one-sided legacy narrative and most of all they think loyalists and former members of the security forces are set up like bowling pins, ready for them to just hurl their latest ball of rewritten history down the alley at. No more. There is a growing grassroots PUL movement that isn’t having it. A growing movement that is going to challenge every attempt to rewrite the past, is going to challenge the media to provide a fair and balanced narrative but most of all that is going to ensure that what’s good for the goose, is good for the gander. There will no longer be one rule for loyalists and the security forces, and a different rule for the IRA. They want to name people in the absence of charge and want a media free-for-all which subsumes the role of the criminal justice system, then they should realise that the unionist community will no longer be respectfully facilitating nationalism’s legacy agenda. It is time to re-balance legacy. And so too is it necessary to rebalance the current policing system, whereby the Paramilitary Crime Task Force are used as a blunt instrument primarily set up to target loyalists. I have said it before, and will reiterate it again within this article, if anyone is engaged in crime- regardless of who they are- then let that crime be rooted out and such persons placed before the courts. That is fair and legitimate. What is not fair and legitimate is the law being applied differently depending upon political expediency. The PCTF is the child of a political agreement and works in partnership with an unelected consortium- namely Cooperation Ireland. This unelected body provides guidance to the PCTF about who is playing ball, and who isn’t. In other words it creates a politically driven system of good loyalists, and bad loyalists. This system then filters into the policing priorities and as such those deemed ‘bad loyalists’- simply because Cooperation Ireland has designated them as such- become priority targets for the PCTF. This is the very epitome of political policing. We also hear regular commentary from the PCTF themselves around how they establish ‘priority targets’. Such priority is part driven by guidance from the consortium, but part driven by the public discourse. Therefore the media have a role to play in effectively designating targets for the Task Force. In this regard it would be insane to believe that the PCTF aren’t using a clever strategy of deniable leaks, and official press statements, as a means of fostering public discourse and setting up targets. First and foremost from a policing point of view, if you are targeting a specific person or group, is it really sensible to alert the persons in advance? This would lead me to believe that PR and the optics are more important to the PCTF, rather than the quite legitimate pursuit of crime. Only last weekend we had a prominent story carried in one of the Sunday papers which attributed leaked details of an alleged PCTF operation to “security sources”. This raises serious issues; are the PCTF leaking systematically to the media? Are those who would be up in arms if such leaking was going on in relation to others, more than happy to ignore it because it is directed against loyalists? Either the media are making stories up and dreaming up sources that don’t exist, or else (as I suspect) the PSNI are engaged in a dirty tricks campaign against the loyalist community. It can only be one or the other. The PCTF’s public statements are equally disturbing, whereby quite often they release inaccurate statements for the benefit of a dramatic media story, and to blacken someone in the process. They have no regard for the Article 6 Right to a fair trial, or the Article 8 Right to privacy. Are loyalists not entitled to be treated in the same way as every other citizen? Loyalists, like every other member of society, deserve to be treated equally under the law- and also to be held equally subject to the law. If a loyalist is committing a crime, then pursue such persons for crime. What is not acceptable is pursuing loyalists to a different standard than other members of society. “Injustice anywhere is a threat to justice everywhere”.